disease of oral cavity treatment? This is one of the documents distributed every time, and an opinion and the flow of the lecture are spoken vividly and precisely. Does restoration and the prosthesis wearing finish the disease of oral cavity treatment? Restoration and the prosthesis wearing are permanent bandages and are a protective prosthesis acting for a function and are the substitute (artificially) organ which fits the living body becomes worn out, after ages, and itself is worn out, and continues aging. Therefore they are only ends of preparations for healthy maintenance but not the completion of the treatment. Treatment of the diseases is a symptomatic treatment and remits temporarily as far as the existing life of the etiology continues even if it has improved some how. "The etiology removal and the physical strength reinforcement" did not recover their health if not in a condition to be able to maintain health thoroughly. Therefore, the completion of the treatment is created in improvement of the life by the awareness of the patient not what there is only in the hand of the doctor. The control of a heart and the body in the social life is management control for oneself by the awareness., and is carried out only by awareness. Therefore, the medical person lets patients promote the awareness of the sick through medical care, and he should become a helper of the improving of life of patients. If a patient can understand these purposes during the period of the recovery treatment, the patient changes into a client requiring continuous examination and advice, help, and growing up. The clinical trial example that had you seen is the record. The medical idea in response to a question is based on the proof that was provided all by the record of the clinical trial example. Dental therapy namely, the disease of oral cavity is directly related to eating habit. Even if a medical person prevents the progression of disease of the patient, and revives a patient to chew without hardship, and to be able to eat happily and comfortably, can you say it is perfect as medical care? The typical dental caries (cavity) of oral cavity disease or disease (pyorrhea) of the neighboring organizations affect important chewing function in oral functions remarkably, and change oral cavity pathologically, and the change becomes habit forming and come to stay. First a state not to be able to chew for slight disorder comfortably. Then a condition to be worried about having a pain, and gradually chewing. State not to be able to chew after all. The morbid imperfection chewing becomes a custom during the long period of several years. I revive a patient until he can eat unconciously by treatment. Generally such treatments are recognized as dentistry. However, by such treatment, a symptom is only improved, and the cause of the disease is not removed. The cause of the diseases is still kept and is only increased, and is not attenuated at all. In addition, it is the recovery which not completely cured by natural healing power, and the recovery is only substituted by the artifacts out of harmony with organization. Further in many cases, the disharmony of the recovery treatment strengthens imperfection chewing still more. The recover and improving to an enough chewing state to keep true health, cannot be expected allmost. The effect of a state of such a recovery namely imperfection recovery treatment is only nothing but as a result of temporary therapy. Therefore I should say incomplete treatment to recur by all means. It cannot last long and repeats a recurrence in the short term. And the organization losses increase by all means whenever it recurs, and the functional disorder turns worse. The patient becomes the edentulous jaw, and the result is hard to be restored by the full dentures and progressively worsens up to inability. All people are dissatisfied with the recurrence of the disease, and, including damage, the wear of such a recovery treatment, the patient’s distrust of modern medicine is born here. All people will hope for long-term permanence of the restored health condition. It is the reason that new medical care is desired earnestly. For the prevention of recurrence, an etiology must be removed. The main cause usually affects the way of the eating habits in the everyday life. n other words, fire food, a high temperature soft meal, sweetness addition food, imperfection chewing are first causes. Therefore increase of the resident flora by the abnormal increase, stagnation of oral habitual presence bacteria and an organization resistance decline are causes of diseases. Therefore, as a local etiology exclusion method, I proposed an enforcement of the removal of the dental plaque namely the appropriate brushing for 40 years. It was finally generalized. However, a dietary modification is the decisive factor of the root of the prevention of recurrence because there are most of prime cause to let plaque delay abnormally for the way of the eating habits. In addition, it was recognized that it was the important pillar of preventive measures against first deeply. So instruction of the eating habits improvement came to be strongly expected by the reflection that the conventional medical way was unconcerned about this point. In postwar dentistry, we should respect the independence of will of the sick and remove the etiology that there is in a lifestyle and revives a disease in a patient cooperates with a doctor, and must be the democratic medical care to play a role of the life leader of the making of health exercise. Therefore the medical care becomes the community of a doctor and the sick, and the exclusion of the etiology is largely incorporated in a role of the recuperation of the sick. In addition, on the other hand, as for the medical person, dentistry that the etiology removal measures by this dietary modification are not accompanied by must recover itself on the medical care of the corner-cutting of the one hand omission and the recognizing anew with the thing that it should be said. For 40 years, I continued performing a campaign to promote an enforcement for appropriate brushing for local cleanliness maintenance and generalized a television monitor device to see dental plaque for the motivation. And because it was necessary to let the need of the eating habits improvement strongly decide an incentive and practice, I translated and self-published "Nutrition and Physical Degeneration" of Weston Andrew Price" and let lent it to a patient, and let a patient read it. The completion of dentistry (comprehensive dentistry to prevent a recurrence) must be to improve the wrong eating habits causing the dental diseases, and to hold the eating habits soundly and the medical care except the etiology. Making it a practice of livingry to a patient during a period of the cure treatment. To harmonize the wear of the restoration thing of the patient with the living body, we carry out a periodic medical examination supplementary and all treatments. during a maintenance period for the long term. However, we persuade a patient into recurring by all means if a patient does not carry it out and establish perfection medical care (clinical practice to cooperate to advance toward making the health including the best dietary modification) even little by little and must do it for clinical dentistry from today. General dentistry is to prevent the progression of disease and to revive a patient to be able to eat happily and comfortably. The typical ones of the disease of oral cavity are the dental caries (cavity) or the periodontal disease (pyorrhea). These diseases cause the disorder of ① important chewing function in oral functions, then ② morbid shift occlusion during several years and ③establish imperfection chewing. We begin treatment and revive a patient until he can eat without being conscious. However, will only perfect treatment be enough to get the trust of the patient? ①It remains for the symptom improvement that is kept without removing an etiology. ②It is attached and work as an out of harmony artifact without organizatin being restored. ③It is the imperfection curative treatment that is only a symptomatic treatment for the present sympton, and such a treatment cannot last long. And it repeats a recurrence during a short term, and the organization losses increase by all means whenever it recurs, and the functional disorder turns worse. ④Aggravation, the recurrence repeated many times gives distrust of dental treatment to a patient. It becomes the edentulous jaw at last and it is just and turns worse so as not to be able to expect the complete recovery of the chewing function by the full dentures either. It is the place where all people hope for dentistry to last long for a long term of the restored health condition if I do it this way and will be the reason that new medical care is desired earnestly. For the complete treatment and prevention of recurrence, the etiology removal is required. In other words, I achieve the removal of the plaque by appropriate brushing. However, there is the prime cause to wake up stagnation of the plaque which is this local cause in the eating habits such as fire food, high temperature food, a soft meal, the sweetness addition food. This attenuates resistance of the masticatory apparatus at the same time. Therefore, a dietary modification is the decisive factor of the root of the prevention of recurrence. Besides, it is necessary to give certain result by a more effective method not a sermon to let a patient understand this treatment concept. You each realize the role of a patient, the medical care person again to carry out these things, and to let you succeed and you collaborate and must wrestle. I develop TV monitor device conducting microscopy on plaque to promote an appropriate brushing enforcement. I let I strongly motivated the need of the dietary modification, and practice take it off by translating "the eating habits and the physical degeneration" of Weston Andrew Price, and having you rented this and read. I improve the wrong civilization eating habits, and dentistry that there should be must be medical care to become it soundly, and to permanently remove an etiology. Required first action improvement measures to completely revive chewing. We complete livingry instruction during a curative treatment period. By periodical consultation, it is all assistant measures of the restoration thing. A way to trusted medical care. You must assume such a dentistry social on-site dentistry from today. 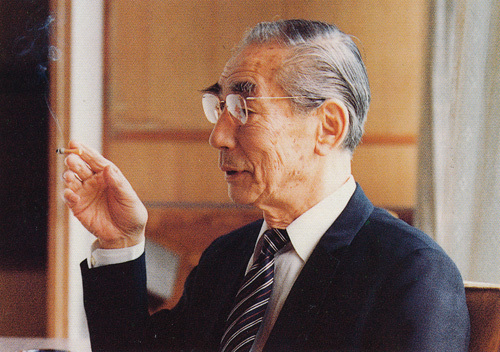 From preface of "Thought of the clinical dentist II "
"Two gatherings listening to clinical practice of Mr. Katayama" which was held by the request of several dentists at 3M hotel (Nara) and Oiso Academy House (Kanagawa) in September 1981 were the beginning of the Katayama Seminar. 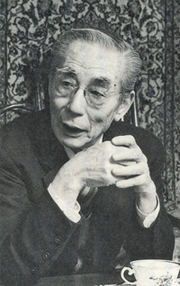 So, in Kanto and Kansai, I held seminars without taking a rest in spring and autumn for 15 years. The place which seminars were held were Oiso (Hakone, from the 13th) and Kyoto (Kansai Seminar House, only one held in Nara). 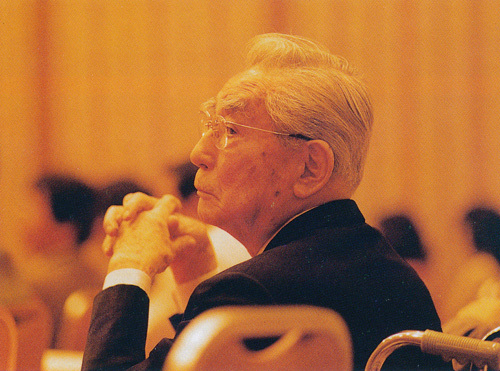 After a year, it was developed into the form called the Katayama Seminar generally. When the academy house was closed down in November 1996, the seminars ended. The seminar form is not change from the first. It is performed in 2 days and 1 night of Saturday and Sunday, and all the members talk about the seminar including night watch, and performed once again one month later. It was done .30 hours for four days in total. Because I wanted to talk until a participant understood it, I took the time enough. The object was an opening of business dentist mainly, but a lot of family and all of staff who worked together participated. The participant counts a total of approximately 5,000.
mistake was, or, about an example to turn out, and not to grow that the measures result that oneself aimed at thought as for the aim that fully performed frank talks including night watch, where was that each participant understood how thought was accomplished. I spoke the point where each one showed a one's clinical trial example concretely, and "here was not cured as expected" or "a result did not go along the will". In answer to it, I showed a similar case in a slide photograph and talked in all the members. Therefore I demanded what I wrote in at an application with the attention of the recommender beforehand to attach the thing which wrote a treatment outline as the main point of the question by all means and built it beforehand to understand by a photograph to see with eyes as its answer. I overlapped with the re-question for my answer, the re-question. Therefore I came to cannot but change it after 4-5 times passed to take the form of the lecture out of the form of talks. In addition, because most of these 4-5 times of contents of talks were limited to periodontal disease treatment, the lecture was based on periodontal treatment and decided to leave out most of the fields such as others, treatment, root canal treatment, the full dentures of the deciduous tooth which I was good at. As a result, periodontal treatment relations increase, and the collection of these photorecordings produces difference with the ratio according to the real field in my treatment, but it depends on such a process. This building was built for a research institute including facilities for training and a few lodgings. However, due to the consideration of the environment, the protection of earthquake and sound and dust proof were regarded important in particular. Therefore I noted it in the protection of earthquake and sound and dust in particular. 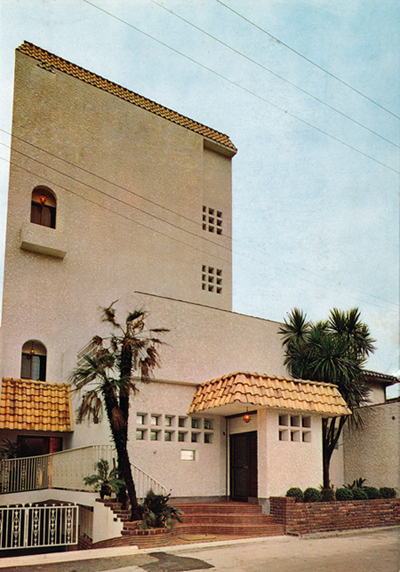 This building was constructed by ”Amerika-ya” construction company. The site of the building has the space of approximately 20 tsubos (66㎡), and the entrance is mere 2meter for bringing of the construction materials, and it does not have a lot to keep the materials. I thank the construction company for having completed the construction while we continued medical practice, and also thank the neighborhood for their kind cooperation. the dentistry, the medical education were already subdivided in those days. And the subjects such as physiology, anatomy and so on were carried forward for a mere class and a pass of examination respectively. However, we didn’t have the time that we had a class of "the philosophy of the medicine" to think about basic "medicine". When class contents were gradually understood, I noticed that there was the big difference between the dental treatment that received until then and the contents of education of the school. WhenI felt even like a heterogeneous thing without the connection really and perplexed to understand the reason that why this happened to, the answer obtained from the leader was that “bread of the life” existed in the difference between "study and the fact" , "ideal and reality". Is the medical care good in this? I was not able to forget that I feel whether oneself go ahead through this way again helplessly, and to have spent time autistic for a long time. I graduated as there was not an opportunity of the discussion either, not to mention a lecture to consider "what the doctor was" "what the medical care was" "what the medicine was" thought to be the pivot of the medical education. And when the authorization as the dentist is given and stood in the world as a clinician, and for deciding not having had confidence and the faith about these basic problems and form of establishment and the practice of the idea as the clinician, I continued very painful struggling and was going to bury an ideal and a real valley earnestly. It is really regretted back that many patients and friends left because of my stubbornness. However, I am proud of having carried through an effort secretly. The dentistry is one medical department and medicine is study of the illness treatment and is the prevention, and is the maintenance and increase of health. The medicine is a technique at the same time as a theory. Theory that a technique is not accompanied by, technique without theoretical proof, they are not medical care. If a technique is not compatible with a theory, I cannot expect satisfactory medical care. The doctor who left the medical care does not exist. The point where you should be careful about here is to regard a human being as only a creature and to think about treatment of illness only by science is not enough. This technique is different from the work of use conveniently, control and conquer the natural world for a human. I spoke the thought for our days gone by and wrote the article of 15,000 characters about readiness of the rest of life. "Chichi" is a Japanese monthly. "Chichi" means to acquire genuine wisdom through practice in "Shusigaku" (Confucian Studies). It is a doctor that let a patient recognize oneself and draw mind to act together. 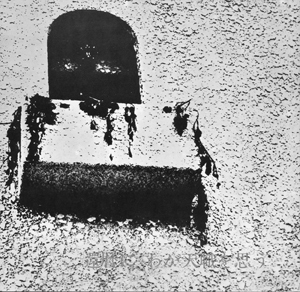 August, 1989 issue. For a long time we have thought that the tooth falls out due to old age. However, judging from my longtime clinical experience, I understood that the tooth falls out because of "a disease" called pyorrhea. Since pyorrhea is sickness, there should be means for prevention and the treatment. Then what kind of disease is pyorrhea? In the bone called the alveolar bone, the tooth root is buried well, and the tooth stands. And the alveolar bone in the gums gradually melts when bacteria get from the border of the gums and the tooth and deepen. Even if the tooth itself is healthy, the tooth shakes and will fall out at last. In many cases, it is hard to notice because I do not feel a pain until I become seriously ill. However, the various symptoms should come out when they are conscious and observe it. For example, please see color of gingiva. Turn up the lower lip quietly without putting power. The backside of lips should be light pinkness. When color of gingiva is at the same level or it is lighter than the backside of lips, it is good, but it may be said that it is unhealthy when it is darker than the backside of lips or there are the light and shade. In addition, it will be a warning when gingiva surrounding a tooth turns red in shade approximately 1mm or interdental gingiva is red remarkably. Then at first it is pyorrhea if you are bleeding at the time of toothbrushing, and there is that a toothbrush turns red several times. In addition, I think that it is result such as the pus to drain from the gums when breath gives off a unique unpleasant smell. When there is not a cavity, and gingiva sometimes swells up and aches, it is almost certainly seriously ill. Most dentists have often pulled a tooth conventionally when they suffered from such a pyorrhea, or there is the dentist operating on the gingiva.. However, I deny an operation. It is a mistake "not to be cured at least if not operated on". This is because it is cured even if not operated on. As well as it, I assert that I should not operate for pyorrhea from various points of view. This is because an evil is bigger than the advantage by being operated on. A condition is included in the word "to be cured if operated on" by all means. It is a condition called "completely removing plaque by brushing every day". If plaque is left, it recurs immediately. The complete recovery operation without this condition exists nowhere. For a patient, an operation is a great event. Therefore the patient feels relieved saying "it should be cured because I had you perform great operations" and makes light of "a condition" and comes back to the former life. Surely the lesion of the tooth root part disappeared temporarily after an operation, but, the cause did not disappear. If a lifestyle including the toothbrushing is restored, it recurs easily and turns worse more than before. Therefore I tried the therapy that "performed only management without being operated on". This therapy was the original form of the natural good talent activation therapy (Physiotherapy) that I proposed today, but it was good in progress and since then confirmed, "I did not need the operation" in the clinical practice experience for 40 years sufficiently even if I did not operate. If you do not let plaque accumulate, strengthen the gums and mind systemic health and return the blood supply to the gums normally, an etiology is removed and the nature healing power of the body revives a bone even little by little and strengthens a bone basically. If a patient changes life and does not devote myself to good self-care, the complete healing of pyorrhea is not possible. It recurs by all means even if I take the swelling by a symptomatic treatment. When subjective symptoms begin to appear though this progress of illness is late, swelling and pains are frequent at an increasing tempo, and the pus quantity that begins to leak increases and cannot chew. And it is common that the tooth falls off in several months or several years. When continue living life that a tooth falls out for pyorrhea, bone itself of the chin gets thinner by all means, and dentures are not correct, and, as a result, not to mention work, the pleasure of the meal and the chattering are robbed of, and there is even a patient causing personality collapse because of too much bad humor. Whether we can save this tooth greatly depends how long "the motivation" of the patient is continued keeping. In the case of me, I recorded gingiva with a color photo and, talked about how a condition was improved in comparison with "the first medical examination" and "the present conditions" with a patient until now. These two can be realized to a large extent by careful brushing. The brushing serves as training gingiva not only to remove merely plaque, Do not forget this. Then the toothpaste should prohibit it entirely. Not only interfere of viewing whether a point of a brush is the place to aim at, or gingiva is damaged, but also root wears down with a toothpaste, and water soaks, and is because the next treatment often becomes difficult. In addition, it lets blocking a patient from understanding taste and a smell of the bleeding, and there is the uneasiness of the health side for an additive, too. A tooth turns black and dirty when I do not use a toothpaste, but it is patience for a while because a tooth whiten again when a patient continues polishing for several months. Because removal of plaque and training are purposes, it is greatest meaning to continue. Primarily I want to expel sugar. The sugar has an influence on not only the cavity but also pyorrhea more than expected. The sugar makes plaque badness. To that end, at first a patient should begin to chew a soft thing 50 times per one full mouth. Saliva flows by chewing. A hormone in saliva helps the recovery of the bone. The blood circulation of the gums improves, too. The nerve in tooth (pulp), alveolar bone and periodontal membrane are supplied with nourishment and oxygen by blood, but the blood supply to the thin blood vessel around the tooth is apt to decrease. Therefore, I want to gradually increase bloodstream. To that end, jogging and cycling, swimming are good, but it is abdominal respiration vomiting air exhaustively that I can carry it out easily, and is very effective to the gums. Fourth, the habit of grinding and the clenching will make an effort for a purulent discharge because it is very bad to check it. And it may be important one more. The health of the whole body greatly influences pyorrhea, too. If blood sugar level is not controlled well, I cannot expect the purulent discharge recovery. There is less influence than diabetes, but the arteriosclerosis is easy to disturb struggling with illness, too. You will have to be careful about cholesterol and acylglycerol. The stress is easy to influence a tooth, too. Because originally a person with pyorrhea has weak gums, with stress, lack of sleep, fatigue, little unreasonableness, the gums turn worse immediately. In addition, the point where you should be careful about is a lot, but there is not the specific medicine, "a purulent discharge recovers only in this" in the pivot. I wait to be cured by oneself while helping a patient. And, meanwhile, I bandage it to never re-infect it so that a pain does not become severe. However, because bandage in itself does not function, I let the bandage which does not function to function, and it is a true purpose of the dental treatment that was cured by a bandage lasting a long time. However, the cavity is not completely cured. Ambroise Pare of the founder of the surgery tells you " I bandaged him and God healed him ". The doctor can support a patient to cure, but it is power of a patient to really heal. It is that a person understanding it clearly is a true doctor. There are approximately 50 trillion cells in our body and they cooperate with each other and keep our health. Bacteria more than twice the number of these cells live in a body together. If there is the bacteria which do not harm a human being, and lives only by oneself, there is ones to harm. Balance is kept while the symbiosis is in a state. The balance collapses that is a human cell and bacterial symbiosis collapse, and only one improves and is ruined together. The state is the present disease. The adult diseases are all such a disease. The organization is weak and narrows if we do not use a hand and the foot. If we does not use the tooth, the tooth and the organization which supports a tooth weakens, and it will be natural to worsen. They get worse at once if we eat without chewing the thing which should chew. With a choice of right food, we eat definitely. In other words, it means that we chew well and eat. I think that it is a dentist to deserve to be a leader of such eating habits most, and we must contact in a manner "to have this person change for this person" with a sense of duty. A doctor and a medical person do not tell a patient and contact so that drive them notice by oneself and, as a result, they notice by oneself and cures life. I believe that it is the way of the true doctor. 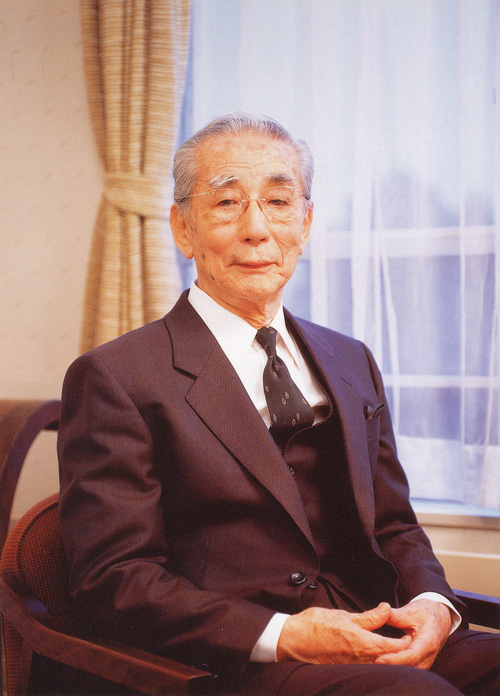 The books which Mr. Katayama read by himself and thought that he wanted other people to read was marked with "a check". These books were recommended or given as a gift. The premeditated activity that a person of maturity performs for cultivation of the spiritual life of the immature person is called education. Education is always intentional and is work of conscious will, and the education is based on a plan. And the way of such an education is called intentional education or formal education. On the other hand, without the intention that is going to educate such a person, social life itself may make a human being. In other words, the influence by media so as politics, economy, custom, fashion, radio, TV, movie, newspaper and publication unexpectedly greatly has a strong influence on the modern society for the young people in particular as far as they live. The education is the mental basic authority that is performed anytime wherever in the human, and this kind of education is named non-intentional education or non-formal education. Actually, the non-intentional education is related to intentional education and gives plastic action to a human being. Thus, while the person act and lives together , he is influenced unconsciously and is formed in some kind of directions. In this social environment, there is the positive aspect to give big power for the human being formation, but, on the other hand, there is the obscene negative aspect of the anti-value so that cultural lag, a flood of the stimulation, the flooding of the defectiveness culture, social evil, pollution remain. You must not forget this. How the educational influence on child given by such a home or the workplace or environment is big, is shown by the allusion of Three moves by Mencius' mother. Three moves by Mencius' mother；The importance of creating an environment conducive to a child's learning. 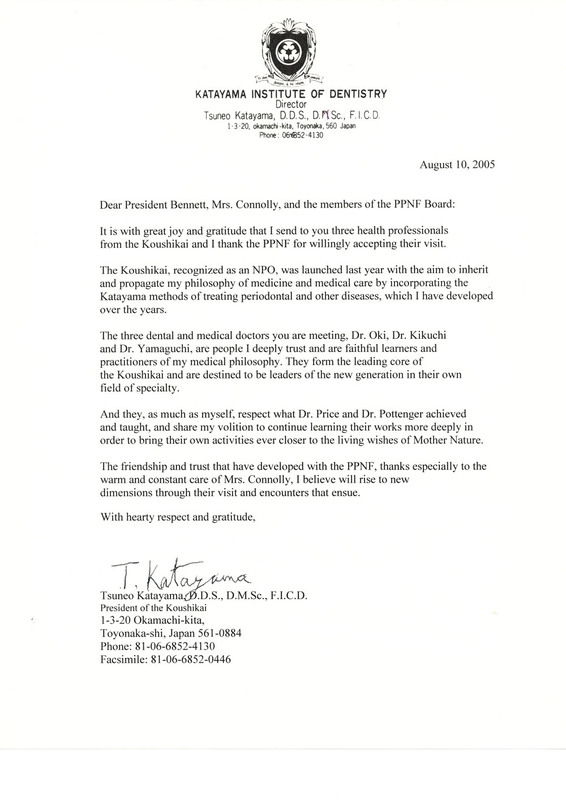 In 2005, Oki, Kikuchi and Yamaguchi, three directors of Koushikai visited PPNF, and Koushikai managed to establish sisterhood relation with PPNF. Private letter of Dr. Katayama has been presented then. Copyright © 2019 NPO法人恒志会 All Rights Reserved. powered by Quick Homepage Maker 7.1.1 based on PukiWiki 1.4.7 License is GPL.